IJUSEng is the first international journal exclusively dedicated to unmanned systems engineering. The journal promotes the advancement of the applied science, technology and operation of unmanned systems through the dissemination of original research representing significant advances in the design, development, testing and operation of autonomous systems. 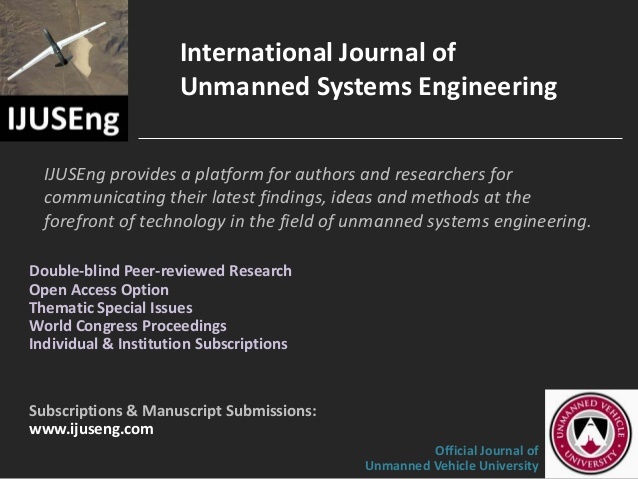 IJUSEng provides a platform for authors and researchers for communicating their latest findings, ideas and methods at the forefront of technology in the field of unmanned systems engineering. The Editorial Board will consider high quality original research articles, review articles, point-of-view articles, correspondence, technical notes and conference reports in the areas of aerial, ground, surface, underwater and space vehicle engineering. The scope is wide, covering research, design, development, operation, safety and reliability.